In the final book of the Hunger Games trilogy Katniss fought back against President Snow. She was the Mockingjay, the symbol of the rebellion. She had to be an example and lead the rebellion while also dealing with her emotions. The Capital had captured Peeta and the number one thing she wanted was for him to be safe. The second thing Katniss wanted was to kill President Snow for all the pain and destruction he had caused. I was very disappointed with this book, after being so excited to read it after finishing Catching Fire and loving it. I felt the story lacked real emotion. It was more like reading a series of events, without really feeling emotionally connected to the characters, like I had with the other books. I read things that should have pulled at my heart but I only felt disconnected from the story. I don’t mean to be harsh but after the beautiful work the author showed with the first two books this was a huge let down. I’m perfectly happy reading books that aren’t all happy and have fairy-tale endings. I read a ton of books that do not have happy endings. With that said I need to feel the emotion that the characters are supposedly feeling. I did not feel that in this book. This book gave me the feeling like that author was done with the series and just wanted to end it. I also didn’t like how the future was tacked on. When I was reading it all I could think of is Harry Potter and the Deathly Hallows. It was different because the story was not the same as Harry Potter. It showed her about twenty years later, who she ended up with and how her life turned out. This also made a statement from the author saying, “ok you know how their lives ended up, I’m done.” It didn’t feel original or give me much of a feeling for the characters’ lives. The story line was a good idea but I just felt that it was wrongly executed. She could have made this last installment great but instead I feel like she ruined it. There are people that enjoyed Mockingjay, Claire from YA Bookie Monster loved it, read her review here. I'm sorry to hear that you didn't like it, I liked Mockingjay just as much as the other books in the series. I do agree with you on the epilogue though, she could have left it out and not just dumped a pile of "this is going to happen" information on us. She could have tried to put some hints about what they're all going to do in the last chapters of the book, or just left it all to the reader's imagination. I haven't started the trilogy but at least now I know! I read Mockingjay right when it came out. I know some people were disappointed after loving the first 2 books. I happened to love all 3. One of my favorite series. Love love love. I read Mockingjay, I thought it was the best of the three. Thank you all for your opinions. I understand that some people loved it and some people didn't and that is why i included a review of someone who loved it. I did give it 3 stars because It was well written and she had the story I was just very disappointed from what I came to expect after reading and loving the first two. I hope if you haven't read the Hunger Games that you still will because to me the first 2 were amazing! April... I felt like I should have been crying but like I said in my review I felt disconnected from the characters in this book and just didn't feel the emotions like I should have. For those who did love Mokcingjay I'm really glad you did. I wish I would have more. Who knows maybe I'll go back later and read it again, knowing what to expect and analyze it better. Thank you all for your feedback! I appreciate it! I completely understand. I seriously loved the first one, and the second one was pretty good. But this one.. I had to skim a lot of the war stuff going on. It just didn't work for me. I did feel some closure with the ending, knowing who she ended up with and how she was doing, so that was a plus for me. But I get your feelings about this one. Thanks for the feedback mickey :) I did read your review for it on goodreads so I saw you shared some of the same feelings :)I get what you mean for the war stuff.. I think it could have been executed more so it was more enjoyable like the Hunger games were... well not enjoyable for the characters but fun to read about lol. Thanks again! Can you believe that I've not yet read Mockingjay? 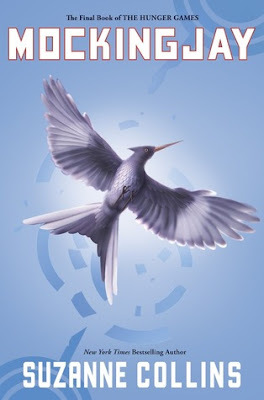 I've read a number of negative reviews about Mockingjay, but would still love to pick up this book someday and read it. Of course, I'll have to compare it with The Hunger Games. I couldn't help but feel really sad while reading this book. It was sort of depressing and just a disappointment. i was not satisfied with the ending, but I really enjoyed this series. Great review. I was satisfied with the way Mockingjay ended although I wasn't a huge fan of the Epilogue. I have the first two books in this series but am waiting to read it until I snag a copyof Mockingjay. Hoping I won't be disapointed in it. Keeping fingers crossed. I've been hearing good things about this series. Sorry to hear Mockingjay was such a letdown for you. yeah, I had heard that Mockingjay was bad. I only liked the first book. Too bad, Suz was great. I have heard that this series was good, and that I should read it. I have seen some good reviews. I am sorry to hear that this book was not something you enjoyed. I think I will get them from the library to read instead of buying right now. Wow! I was actually scared to read your review because I'm currently reading Mockingjay and I was afraid the review would contain spoilers. Thank you so much for this spoiler-free review. I must admit that I'm also not connecting with the characters at the moment. I'm really curious to see how this series end, though, and I can't wait for the movie to release in March. Great review! Mockingjay was my least favorite of the series, but I LOVE the Hunger Games series as a whole!!! I thought Mockingjay was an awesome finish to the series and have recommended it to all. I was a little disappointed with Mockingjay too, but I still love the series as a whole. Great review! I too was eagerly waiting to read Mockingjay and agree that for me this one was my least favorite of the 3 Hunger Games books. I did still like Mockingjay, though - it just wasn't as awesome as the other books. Great review! your not the only one who thought the last book wasn't that great. Everyone liked the first book and the second book was alright but then the hardly anyone liked the third book. I haven't read the series yet since I'm only going to watch the movies, so I'm not sure if I will ever get to them. I loved Catching fire and was so excited for this book for a year and then was so disappointed in this book too. I believe that collins is best at writing the games.